Venezuelan President Hugo Chavez has announced that he is restoring his country's ambassador to Washington. 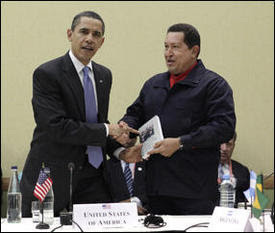 After exchanging greetings with US President Barack Obama at the Americas Summit in Trinidad and handing him a Spanish-language copy of Uruguayan writer Eduardo Galeano's book Open Veins of Latin America: Five Centuries of the Pillage of a Continent, the Venezuelan premier voiced hopes of beginning a "new era" in relations - and said that he had already chosen the new envoy. Washington hit back by kicking out both countries' ambassadors. Mr Chavez said: "I have spoken with former foreign minister Roy Chaderton and I have designated him as the new ambassador to the United States. "Now we just have to wait for the US to give Mr Chaderton the approval to take up this most important post to direct a new era in our relations." The US State Department said later that it would "work to further" diplomatic relations.